You have heard a lot about 'health care inflation' over the past 40 years or so. You would think that much of the 'inflated' cost of health care would have to do with paying a massive skyrocketing number of highly-skilled physicians, surgeons and specialists, right? After all, these doctors are THE most important part of any medical procedure when it comes to figuring out what is wrong with your body, isn't it? We have had several surgical procedures over the course of our lifetime. The two most important people I wanted to talk to before the surgery were 1) the surgeon but most especially, 2) the anesthesiologist. If you thought most of the increased costs in health care were going to the physicians and surgeons and specialists, you would be most definitely wrong. Take a close look at the chart above. The number of doctors in America has roughly has doubled or so, perhaps a little more. Perhaps 125% growth. The population of the US has increased about the same amount over the same period of time. But take a good look at the number of administrators that have been added to the US health care scene in these past 40 years! Over 3000%! When something, ANYTHING, increases by 3000%, that means the number has increased exponentially, not linearly or even geometrically. 125% growth over 40 years is about a doubling in number. 3000% growth means 'it has grown in magnificent leaps and bounds'! If there were 10 doctors in your hometown in 1970, there would be roughly 25 doctors working there today to take care of everyone. 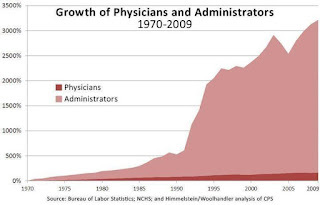 If there were 25 administrators in the medical field in your town in 1970, there would be over 750 health care administrators in your town today. Where do you think the increased costs in health care have occurred over that time frame, in doctor's salaries or what is more commonly referred to as 'G&A' expenses ('General Administrative')? The federal government has made it clear that they think the problem is in doctors' fees since they have repeatedly been lowering the 'Medicare/Medicaid reimbursement rates' for the past 2 decades at least. But they don't control the salaries of the CEOs and the administrative staff of these large hospitals and medical practices so they can't 'lower' the reimbursement rates to them directly, at least as they can with the doctors. Are there more or less support staff nowadays than way back when? Think about the elementary school, junior high school, high school you attended perhaps as far back as the Dark Ages of the 1960's (Triassic Period) or the 1970's (Jurassic Period). Do you remember tons of 'other people' working there other than the great teachers you had and perhaps a principal, assistant principal, some office support staff, coaches and 2-3 driver's ed teachers? According to a recent Texas education report, every public school had roughly as many support staff and administrators in it as the number of full-time teachers and educators. In every school. In 2009. That is a 1-to-1 ratio for those of you keeping score at home. So it is not just health care where the number of administrative staff has exploded over the past 35 years, is it? Public education suffers from the same sclerotic bureaucratic diseases as modern American medicine today. What is driving this surge in administrative staff in the medical world and public education? We have had doctors tell us they spend 50% of their waking, working-day time filling out paperwork, complying with regulations and overall, making darned sure they do not get sued by anyone. 50% of their precious time. Even with all those staff support people. Weren't doctors trained to 'fix' people and help cure them of what ails them? Why do we tolerate such a clear waste of time and talent when so many people are sick and need their help? Making our well-trained medical personnel to fill out forms for half the time they are at work is like asking Secretariat to run in The Kentucky Derby with 5000 pounds of weight on his broad back. We want them to do their jobs which is to heal people and help them get well. Just like we should all want great teachers to 'just teach our kids well' and not be over-worked secretaries, truant officers, psychologists and crowd control police. We recently read of a large medical center where 42 administrative personnel were making well in excess of $1 million per year in salary. Apiece. Per head. Per capita. Generous benefits on top of those generous salaries. The two top executives were pulling down $6.2 million and $4.3 million in annual salary. That is a lotta tongue depressors and MRIs that have to be sold to pay for those high salaries, doesn't it? Medicare and Medicaid only covers some of those costs so where does the medical industry turn to get the money to pay for these high salaries and other costs of what are typically hundreds of millions, if not billions, of dollar enterprises? You. If you pay 100% of your health care. Which you probably don't. In which case, it comes out of your insurance company's pocket. In which case your health care premium goes up 16% per year as does the cost to your employer. Before Obamacare kicks in full force in 2014, that is. Want to take a dizzying look at the number of regulations now underway for Obamacare and 'being promulgated' (we love that word for some reason) as we speak and have been for the past 2 years? 7 This language underscores and is not inconsistent with the scope of the disclosure requirement under the existing Department of Labor claims procedure regulation. That is, the Department of Labor interprets 29 USC 1133 and the DOL claims procedure regulation as already requiring that plans provide claimants with new or additional evidence or rationales upon request and an opportunity to respond in certain circumstances. See Brief of amicus curiae Secretary of the United States Department of Labor, Midgett v. Washington Group International Long Term Disability Plan, 561 F.3d 887 (8th Cir. 2009) (No.08–2523) (expressing disagreement with cases holding that there is no such requirement). You wanna bet that every hospital and medical facility in America is going to have to hire tons of new administrative people, lawyers and Executive VPs for Compliance in the next several years? Where do you think health care costs are heading in America then?